Storm is over. Our e-mail system is down (although our phone card is now topped up.) Grey and calm. Wet rocks. White ship in the distance, coming our way. Lyn asks if we’d like breakfast or showers, but time here is preferred. So Rick zips over while we sweep and tidy. Jolly keen folks; our first Silver member hurray. Talk about art work and next September’s exhibition in Plockton, seems a long way away. Rick has a migraine, well a man headache, probably from being outside with no sunglasses for half the morning. Emergency slice of stšllen. 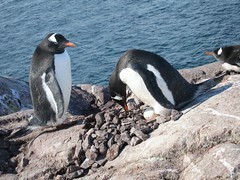 The nearest penguin chicks have a row of paparazzi observing their every peep. H and I have sore tummies, but hungry. Helen and Rick have pasta, and me a bowl of tuna mayo, followed by far too many sweeties. Turns out Irridium data satellite is down – everyone is in a panic, could be another eight hours. Nought to do but wait. We were expecting Fram this afternoon, but they are delayed. Itty bitty restock after Rick has brought deluge of waste under better control. Optimum levels of extra postcards now stacked under the display. Rick is repairing broken sledge rack and half needs an assistant. Helen volunteers and gets cold (and bored.) Big ship Rotterdam cruises past, too many passengers to stop here. I pack postcards, then type. Northanger radios, wanting to catch up with Rick, so I take the handheld down to him. Greg says they’ve had similar satellite problems but it’s working again. They’ll try to anchor at Dorian Bay tonight. I check computer, hurray we have communications again. Oh but bad news from Fram. 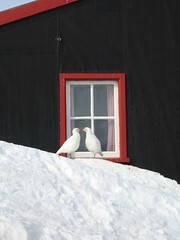 Yesterday they had a power blackout and drifted into an iceberg, causing minor damage, no-one hurt. Needs to be checked out, so we won’t be seeing them anytime soon…and I’ve nearly finished Ian’s wee chart book. Helen picks meat off the chicken and boils up proper stock so that I can produce a thick soup. Also use up very brown bananas by frying them in butter with chopped pears, cognac, sugar and sp ices. Second film night in a row hey hey: Tudor sent us Groundhog Day for Christmas, mostly for Helen, as it highlights the certain repetitive nature of life here. Front row seats on Ricky’s bunk, connect speakers and sit back. Helen keeps asking questions about what’s going to happen next. Intermission to change batteries and eat Rick’s chocolate gingers. 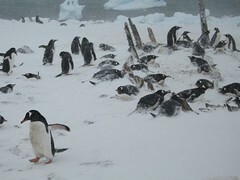 Afterwards, quite a few penguins are standing in their nests, revealing weak-necked chicks wavering in the evening air, their bean-bag bodies so fluffy and tiny velveteen wing flippers. E-mail cousin Katie the desperate news that her ship is not actually scheduled to visit Lockroy. Read a little more anthology and drift off. Ouch my eyelids ache. Six thirty peppermint tea from Ricky. Marco Polo monster at Jougla. Polar Star radio at seven, we have a few minutes to ready ourselves. Hannah et al are full of early cheer. 105 passengers a bit of a blur. One of the staff sights a chick in nest just by our hut – on Christmas Eve how perfect. Only around ten minutes before Ushuaia staff land – Monica and her beaming team, bearing gifts of whiskey and lip-balm! Rick makes us sandwiches to ward off collapse. 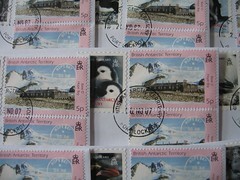 Many Chinese visitors purchase a LOT of First Day Covers. By the end I’m pole-axed. We just can’t accept the offer of lunch on board – dang. Marco Polo’s EL (Alan) and their shop manager swing by for stamps and give us sweet (Rockhopper) penguin zip-pulls. 381 pieces of mail to stamp and frank. Oh and four sacks of mail for us from the Falklands. Rick fixes lunch – tuna mayo – while Helen braves Thai Hot Noodle (a present from a previous passenger, who warned not to use the Whole sauce sachet,) she’s crying and laughing and gasping to recover. Apply stamps to Marco Polo mail, but there’s no time to frank them. No time to delve into the bulging sacks either. Helen stocks up on all the wearables – by the time I go to help, she’s staggering under huge red sack like a misplaced Father Christmas. Shokalskiy: more carols, low spend, dripping kayakers. One hour to frank and turn around. Melancholy. Open four sacks of post with Helen. The new First Day Covers look great. Lovely card from P. Several parcels for me. More for Helen. None for Rick. A few for Port Lockroy, including lovely one from our Oslo Hash House Harrier friend Brit (from initial Nordnorge voyage.) 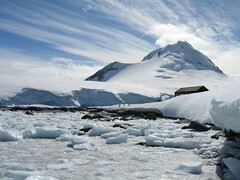 A wave of overwhelmingness hooks me; I stumble over rocks and weep against the glacier face. Aaaah utter tiredness, a flood. So many people to love, and not here. 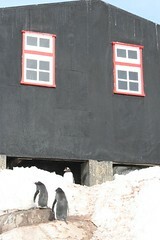 Icebergs impassive, penguins the same. Half an hour later, over to ship. Quick shower next to cold sauna. First in line for food, at Angela’s insistence. St eak, sausage, salad = yum. Stay on bow with happy punters. There is a couple from the Lake District who read a recent article about Helen in their local paper (and bring us up to date, thank the Lord, with Archers gossip.) Chat with architects and wanderers. 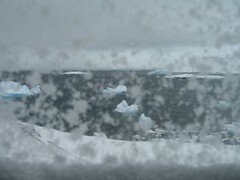 Hunk of glacier is being smashed up for whiskey or amaretto on the rocks. 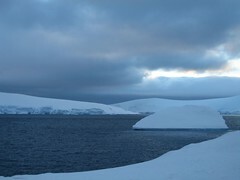 Radio call for us from Antarctic Dream, who are passing from Peltier to Neumayer Channels. Could they please buy stamps and deliver parcels? Helen rides home to oblige and Julio, on discovering a gap in the schedule, persuades her to allow the ship to anchor here and visit on Christmas morning! (He also buys a whole set of First Day Covers, including new ones just in.) Helen returns to Shokalskiy and we adjourn to bar. 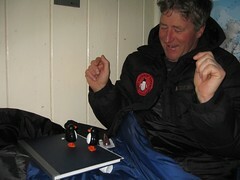 A passenger presents Rick with a parcel – another Pooping Penguin! Then Brendan’s present is a Poolar Bear…even more impressive turds… Triumphant whoops whenever they perform. Home about eleven-thirty, on a boat whose engine kept cutting out. See same zodiac whizzing over to Antarctic Dream, in the back bay; three people fall out, climb in, boat returns to mother, and out for another foray, I think to sing carols. Completely exhausted, but need to wrap presents (one of my most favourite things.) The others are in bed, amazed at how long it’s taking. When that’s done, and gifts are laid around our mini tree, Rick is already snoring. The light outside is mother-of-pearl on far, high, mountains. Have to fetch camera. Sink into bed at half past one. So much chocolate, cake and fruit. Eyes open to sound of Rick shaving, rasp, rasp. Polar Pioneer is here. Spirit of Sydney sails away. Rick goes across for talk. We sweep and reply to a couple of e-mails. Friendly bunch. Crew bring Christmas Lollies (and eggs, and custard, and strawberries.) A chick is seen at Jougla… but in the beak of a skua. We don’t have time to go and look in our nests. One gentleman, who has posted a number of cards into mail box thinks he may have forgotten to address one, could I please check? There’s a massive queue waiting, but I do, and can’t find it… sigh. Helen and I sing carols, which peter away when we have to start adding up! Chat with the cooks – it’s Jo’s birthday, she’s baked us Christmas Pudding, what a star. A couple of keen birders are outside videoing, but the visit is to all intents over. I start franking, Helen cashing and listing stock. Down to boatshed straight away. Find everything except elusive red caps (actually there aren’t any left.) Rick carries up the he aviest box. Once we’re all set again, stew-soup for lunch. I add cream, which is off, will I get a sore tummy? It has started to snow again, and the pressure is dropping. Unsettled. Helen lies on landing rock and snow falls on her. I wonder where she is and squint into the distance, frowning. We have a break of a couple of hours. I sleep until Fram radios. Swiftest visit to squeeze them in after they’ve been delayed due to a Medevac. Ian brings a couple of admiralty charts for me; how did he manage that?! I promise to make him something. Oh and more Christmas treats. Rick fears the island will sink – we have so much chocolate, cake and fruit. Rick tops us up with regular hot drinks. One hour turn around before Multanovskiy – they had kindly hung back and visited Damoy. Frank and hope ink dries. Yum simple organic cheesy pasta, courtesy of Palmer’s Stacey x, tipped down pdq. Campers land first; they all want passports stamping. Then another twenty or so. Forty-four altogether. Doctor has not forgotten previous trip’s promise of a bath, and visions of bubbles fuel entire visit. Last zodiac includes me, Helen and clean knickers. (Fram did our laundry, thank-you.) Blissful soak, the first in two months, with a glass of chilled white. Heaven. Float to bar and swallow a few more glasses with the kayak master, Mark the doctor, Tula, Karin and the Lonely Planet author (Geoff) who is a very interested historian. Pleasurable company. Leave at midnight, promising each other not to be tired tomorrow. There is no break in the rhythm of Rick’s snoring. Awake excited. Blue and blustery, wind from northeast. Last night’s uneaten pudding mixed in with porridge. Rick off at eight am to Endeavour, in close. A yacht, the Northanger radios on their way in to seek shelter in Alice Creek, keen to see Rick. We packed our bags last night; cameras, sun-cream, clean knickers, all that jazz. Good humoured shop (not surprising since we’re high as kites,) and a fresh delivery from the Palmer Bakery – Thank-YOU. The instant last passenger has signed her membership form, we lock the genny room door, hide the key and run down to the landing, singing ‘We’re all going on a summer holiday!’ (Rick rolls his eyes.) 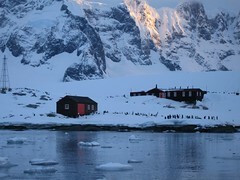 Unbelievably Tim, the Expedition Leader, has forsaken his cabin for the night. Helen and I settle in and head to the bridge to catch up with Tim and Lisa. Jim the film-maker/photographer will share his cabin with Rick, who goes straight for a shower. Then it’s lunchtime – splendid salad and the company of a couple from Arkansas. Also m eet Raydene, from Palmer, who deals with logistics. Ice-cream with butterscotch sauce! Helen tempted to shower, but we’re about to Lemaire… and the landscape wins. Out on deck with the red-coats and it’s glorious. Talk with Rod on the prow. Meet Kathy (from Palmer, also involved with logistics) really good to chat about life, and being away from home (they are away for nine months but can travel within a two mile radius of Station.) 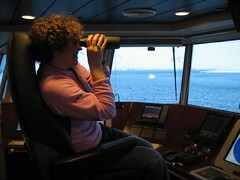 Realise we’re the only two left, and stay snapping and watching for whales all the way to Vernadsky. Into lounge bar where the Palmer gang are camped. It’s incredibly wonderful to be with them. Chat some more and bundle into warm gear. We, the Lockroy/Palmer ensemble, have been placed to land in between the odd and even numbered cabin groups and enjoy what I suspect is a slightly ‘insider’ tour of the base. At every door, our guide, Vlad, in dark suit and maroon shirt says, “This is the most important room!” (…particularly the gym, fully decor ated with breasts.) We even climb up into the roof space to see ozone-measuring machine. Finally to the bar after regarding much ex-Faraday memorabilia, the generator shed and curious humour. The vodka is golden, with a very gentle after-kick in the throat. Odd badges and faux icons for sale. Zip back to ship to pick up passport- may be only chance to have it stamped here. Several vodkas later, Raydene and I remove brassieres with minimum fuss and relinquish them to the bar in exchange for another shot, short lived fame and respect (and Tim wins his bet with Tudor.) Vlad plays guitar and sings heartfelt ballads, barman (infamous for zodiac adventures) performs magic tricks and Base Commander gives us a magnetometer to install temporarily at Lockroy. Out onto deck for a glimpse of Wordie House in the nook of snowy hillocks. Helen would like to live there she says, but she has drunk six vodkas. We are made tea by Stanislaus, swallowed scorchingly to make last zodiac. Shower an d shave front of shins extraordinarily badly. Recap follows soon after, a great insight into icebergs and the animals who live around and under them, accompanied by a G+T. 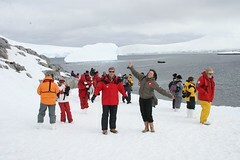 Rebecca and Phil give an intro to life and work at Palmer Station, very well received. We have swung out into the ocean now, and the swell lifts. Ropes are strung between posts to aid lilting walkers to the dining room. Sit for dinner, and manage first course of mushroom risotto. The conversation lurches as we do, until, regrettably (with a steak on order!) the ladies at the table (including me) make apologies and flee. Helen has been sick and sleeps. I join her in Tim’s double bunk for a queasy half-doze. He comes in to type up tomorrow’s itinerary, commenting on the scent of penguin that materialised with our occupation and opens the window! Soon at Palmer where skies are moody and Arthur’s Bay jagged with brash. 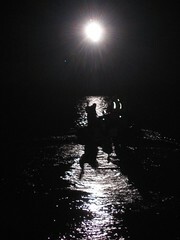 Passengers are to lie at anchor tonight, while staff and crew are invited to a party. Fabulou s ride across with Tim driving… Welcome to Palmer! Great to see the ‘other half’ who visited us a couple of weeks ago. They seem so pleased that we are here; it’s heartening. Phil, the perfect host, offers a wee tour, (which lasts off and on, all night.) Best is the stationary store where I am issued with a ‘Rite in the Rain’ All Weather notebook and a propeller pencil, which, of course, makes me deliriously happy. See krill in large vats in the Krillers labs, the outsides of various clever machines, Kim’s inflatable iceberg and some print designs, the most cared for Ladies Room and offices. Helen still slightly icky and Rick not at full strength either but both are here, Rick talking on a sofa, Helen out on the bar’s veranda, waving to us on the boardwalk. Party is swinging; Philipino crew playing pool and dancing, Marek (Chief Barman from the ship) and a Kriller are a demon shot production line – fruity orange vodka. Utterly delectable guacamole and nachos. Good chatting and letting down of hair. A little more tour, stopping at Ham Radio Room for a luxury chance to view this blog live (!) 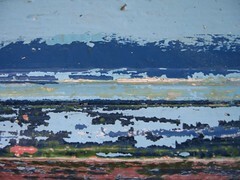 and see Kim Baranowski’s website – she joins us, as does Helen. Tired Rick and Helen say goodnight. Tim is keen to hot-tub, as am I, Phil was going to bed, but comes too. We undress in the sauna to keep clothes warm and dry. Fortunately I have pink lacy post-mistress undies on. Step out into the snowy air and along to the tub. Tim is in first. Oh my GOD it’s HOT!!! 108 degrees Fahrenheit. Yowsers! Skin tingles with the pain of it, I can sympathise with broiled lobsters. We try vortexing to lower the temperature. An officer joins us. So boiling that a contrast is needed – the sea! Steam has rendered glasses useless. Delicately tread along wood, then metal, walkway then rock and snow (ouch! 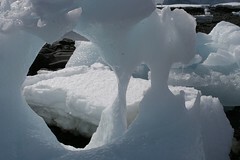 ice burn) and more rock into the cold dark water. Only up to the knees I confess, splashing all over and cooling face ah ha. Swedish chef joins the throng. We have brought hunks of fresh ice back with us, they float and crackle in our saucepan. Highly sensuous to rub the cold along legs and arms still submerged in the heat. More crazy vortexing and finally I am too dizzy. Retreat to sauna all wobbly, near collapse, breath held in the moment. Tim collects a melted me, last on the tender. Once back I walk slowly upstairs, but am summoned back for Crew Mess karaoke (it’s 2:30) Eventually to bed. Helen coughs. Wind blows through porthole from the night.